The Ambassador of the European Union (EU) to the Republic of Mauritius, the Chairman of the National Human Rights Commission and the Hon Vice Prime Minister, Minister of Local Government and Outer Islands and Minister of Gender Equality, Child Development and Family Welfare say NO to violence against women and girls. The National Human Rights Commission and the EU hosted an event in the context of the International Day for the Elimination of Violence Against Women, to draw attention to gender based violence in the Republic of Mauritius. - "Violence against women is a grave violation of human rights and yet it is still widespread across the world. The perception that harassment or being violent towards women is normal and acceptable is wrong and must change. We all have the responsibility to say no, openly reject acts of violence or harassment, and stand by the victims. This event today will sensitise stakeholders on the importance of protecting women's rights and fight against violence. I hope that this will contribute to reduce the incidence of violence against women in the Republic of Mauritius." - "We have to look at the root causes of violence against women to be able to find the solutions to the problem. It is said that violence against women is a manifestation of the historically unequal power relations between men and women and is based on a denial of rights. Our Constitution puts a lot of emphasis on rights less on duties and values within a republic. We have to teach respect for values to our children within the family and at school." The event is a joint initiative of the European Union (EU) and the National Human Rights Commission to mark the International Day against Violence against women. The half-day workshop aims at sensitising public officials, civil society and private sector on different issues linked to violence against women namely discrimination, domestic violence, and harassment. Today's event is organised in the context of the European Union support to the United Nations' campaign on the elimination of violence against women (16 days of activism) which started on 25 November and will end on 10 December for the International Human Rights Day. Eliminating violence against women is at the heart of the Universal Declaration of Human Rights that was adopted by the United Nations 70 years ago. In that respect, the EU and the National Human Rights Commission launched today the Human Rights bracelet campaign. This campaign will contribute to raise awareness on the importance of protecting human rights. The event is organised in the framework of the project entitled 'Promotion of Respect for Human Rights in Mauritius and in Rodrigues' to raise awareness of various target groups like youth, law enforcement agencies, women, school children, judiciary and the public in general on women and children rights. Over the past year, more than 4,000 people have been trained on human rights under this EU-funded project implemented by the National Human Rights Commission. The promotion and protection of human rights is at the heart of multilateralism, and a core and founding value of the EU. 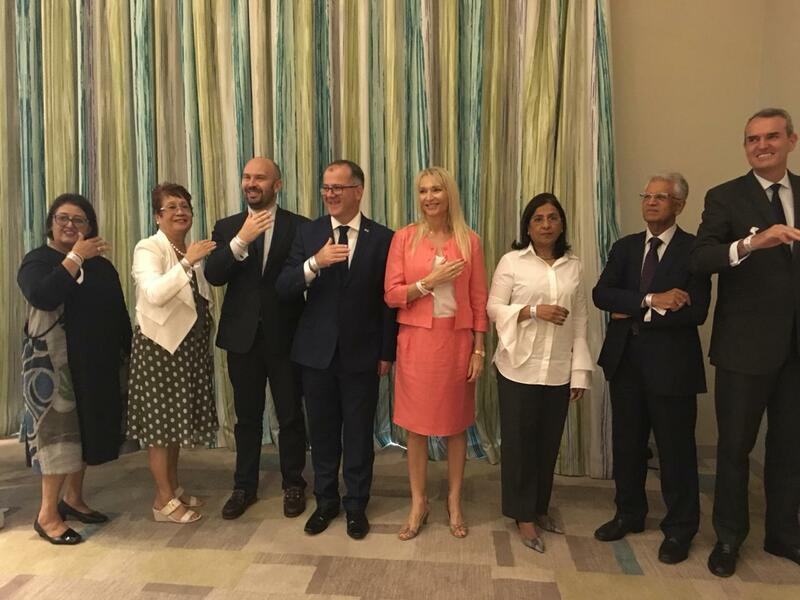 The EU works in close collaboration with various stakeholders in Mauritius, namely Government and civil society for advocacy and awareness of human rights and protection of rights of women and girls. The EU has set up with the Ministry of Gender Equality, Child Development and Family Welfare a High Level Policy Dialogue on Gender. Through this dialogue, the EU and the Government of Mauritius have agreed on key objectives and actions to be monitored jointly for the promotion of gender equality, to address gender based violence, and the economic empowerment of women and girls among others. Eradicating violence against women and girls is at the heart of the 2030 Agenda for Sustainable Development. It is a first step towards global peace and security, a precondition for the promotion, protection and fulfilment of human rights, gender equality, democracy, and economic growth. The European Union has put substantial actions in place to ensure violence against girls and women is ended once and for all. Here in Mauritius the EU has provided support to the Government for the drafting of the Gender Equality Bill, Action Plan for gender mainstreaming and Children's Bill. The EU has also supported the civil society in various projects to fight domestic violence and violence against women. Violence against women and girls is one of the most widespread and devastating human rights violations across the globe. It is estimated that one third of women and girls worldwide experience violence at some point in their lives. This violence is a barrier to gender equality, women's and girls' rights and empowerment and overall development, and an impediment to the achievement of the Sustainable Development Goals. Launching of the Marie Skłodowska-Curie Actions 2019 individual fellowships call- Deadline for application: 11 September 2019The Marie Skłodowska-Curie Actions 2019 Call for Individual Fellowships is open to researchers all over the world, who have a doctoral degree or at least four years’ full-time research experience. The deadline for applying is set on 11 September 2019 (17:00:00 Brussels time).